SUNDAY, March 10, 2019 (HealthDay News) -- High blood pressure is one of the most common medical conditions in the United States and one of the most treatable, an expert says. High blood pressure affects a third of adults ages 40-59 and nearly two-thirds of those 60 and older. "It's something we check at almost every medical appointment, no matter what," said Dr. Kevin Wile, a family medicine physician at Penn State Health in Hershey. "When we can detect it early, we can avoid complications." Blood pressure measures how much force the blood places on artery walls each time a heart beats (systolic, the top number) and between beats (diastolic, the bottom number). New guidelines adopted last year by the American Heart Association and other health organizations define high blood pressure as 130/80 and over. 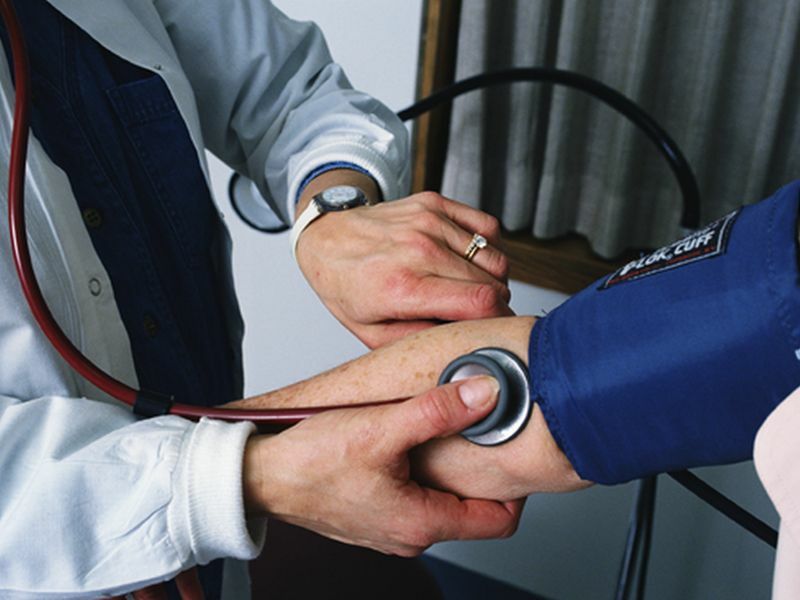 Moderately high blood pressure rarely causes symptoms, so people are often unaware they have it. But those with severely high blood pressure may have headaches, fatigue, confusion, vision changes and chest pain. Those are "big red flags," according to Wile. "If left untreated, it can lead to increased risk of a heart attack, heart failure, stroke and vision loss," Wile warned in a Penn State news release. "It essentially has the ability to affect almost any organ in the body if you go a long time without controlling it." Besides medication, treatment often means addressing lifestyle issues such as smoking, alcohol use, poor diet, excess weight or lack of exercise. Other factors linked with high blood pressure include age, ethnicity, genetics and other health problems. Just a 5- to 20-pound weight loss can help overweight/obese people significantly lower their numbers, according to Wile. One way to achieve that goal is to follow the Dietary Approaches to Stop Hypertension (DASH) eating plan, which is high in fruits and vegetables and low in dairy and saturated fats. "Even if you are not losing weight, it helps," Wile said. "As we do more research, we'll learn better ways to prevent and treat it," he said. "Ultimately, it is up to each and every patient."